There’s no place like home for the holidays and no better time to find your dream home than right now! So, if you’ve been thinking about buying, ’tis the season. While home prices are on the rise in Las Vegas, according to Standard & Poor’s CoreLogic Case-Shiller national home price index released last month, now is still a great time to buy because relative to other markets, homes in Las Vegas are still priced competitively. A new home might not fit under the Christmas tree, but it will definitely be a holiday to remember for years to come! 1. According to the recently released economic data by realtor.com®, Las Vegas is the nation’s number one market for real estate in 2018, which means more people are flocking to the Entertainment Capital of the World. What does that mean for you? While the appeal to move to Las Vegas continues to escalate due to affordability, better quality of life and access to ’round-the-clock entertainment and dining, the availability of home inventory is shrinking. Consider this time one of those “snooze, you lose,” scenarios, so act now! 3. Cooler temperatures are your friend. The Vegas heat can be brutal, especially when you are moving household goods from one home to another. Moving during the winter months may be more incentive for friends and family to help you out, too. You can always show your gratitude by serving them spiked hot cocoa and holiday cookies! And just like polar bears, business for moving companies enters a temporary hibernation during winter months, which means an easier time for you to schedule professional help. 4. Just as moving companies’ traffic slows down, so does business for real estate agents. This is a plus for you, because it means more time for your agent to dedicate to your buying process. Greater accessibility to real estate professionals means a smoother and more expedited home search. 5. You will also generally have less competition from other buyers. While most folks are battling through holiday crowds, roaming the malls, and checking off their Christmas list, you can be signing your way to your dream home, which is more within reach than it might be during the spring and summer peak seasons. 6. This time of year can also mean more negotiating power for you. Sellers are usually extra eager to sell their residences before the New Year, so take advantage of their eagerness for a better deal. According to a post by Trulia, the national online real estate site, home prices are almost five percent lower in the winter. And because there is usually less activity when it comes to buying a home during the holidays, you can be sure to use it to your advantage and negotiate a price more attractive to you and your family. Whether you’ve been naughty or nice, now is the best time to buy a house for those hunting. 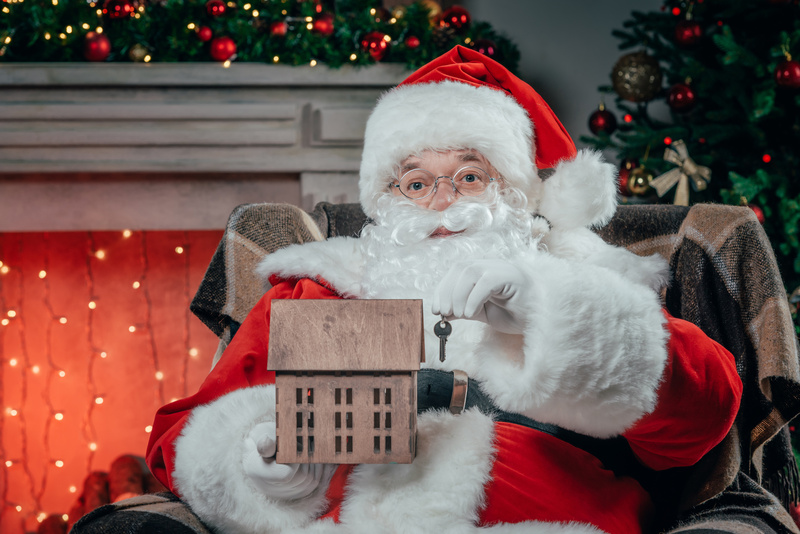 Just like starry-eyed children light up at the joyous sound of Santa’s sleigh bells, you can find similar merriment in the sound of your new home keys rattling in your pocket. And, if condo-living in the heart of downtown Las Vegas is on your Christmas list, we’ve got you covered at Juhl. Our residences might not be equipped with chimneys for jolly old St. Nick’s grand entrance, but word on the street is that Mr. Claus himself likes to enjoy a night cap at The Promenade’s Classic Jewel before returning to the North Pole!